NEW ORLEANS, Louisiana (AFP) – Engineers probed BP's ruptured Gulf oil well for leaks on Saturday but said a giant cap placed on it two days ago appears to be holding despite puzzling pressure readings. 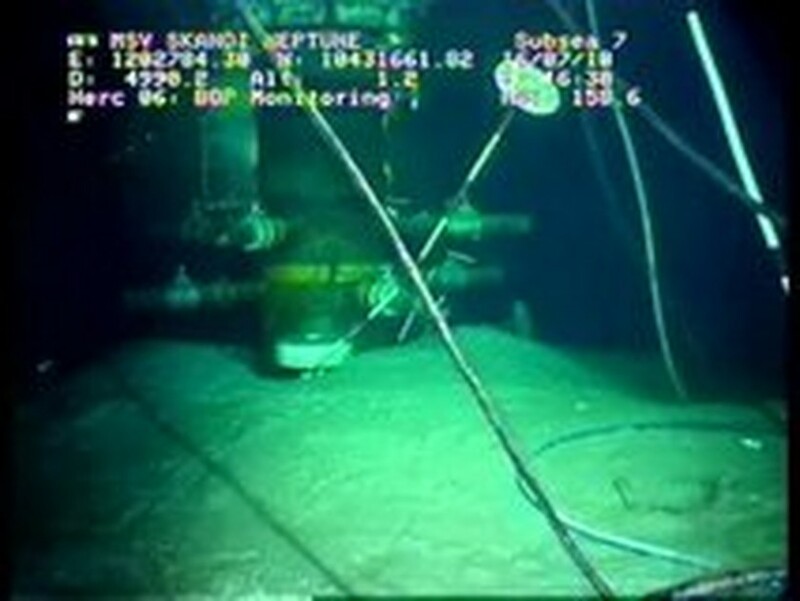 AFP/BP – This still image from a live BP video feed shows no apparent oil leakage in the Gulf of Mexico. "We haven't seen any indication... that we have got any oil or gas escaping from the well," BP senior vice president Kent Wells told reporters after the oil flow was choked off for the first time in three months. US President Barack Obama said the halt to the oil flow is "good news," but cautioned: "It is important that we don't get ahead of ourselves." He acknowledged there is still "an enormous amount of work to do," but called on Americans to remain positive. Government pointman, Coast Guard Admiral Thad Allen, said although the results are "generally good news," the critical pressure readings are not as high as had been expected at the halfway stage of the 48-hour tests, and it is unclear why. "We need to be careful not to do any harm, or create a situation that cannot be reversed," he cautioned. The pressure readings after 24 hours were middling at about 6,700 psi (461 bar), which Allen said meant "there was probably some ambiguity regarding the flow." Two possible scenarios had emerged. "One of them could be the pressure is lower because we have depleted the reservoir," Allen said. The second possibility is that the oil was leaking "someplace in the well itself," Allen said. "We don't know, as we don't know the exact condition of the wellbore." "I was jumping up and down for a while when I saw it was capped," said O'Neil Sevin, who runs a bayou-side shop selling bait, seafood, beer, tackle and snacks to recreational fishermen in Chauvin, Louisiana.